Finding a backpack that doesn’t scream “I’m a camera bag,” but can still hold all of my gear while not killing my back has long been a struggle for me. I’m 5’3″ and most backpacks that can hold a lot of equipment are impossible for me to carry for any extended period of time. Living in a city, typically when I head out for an assignment close to home I’ll opt to bring less gear so that it will fit into a smaller, understated backpack. 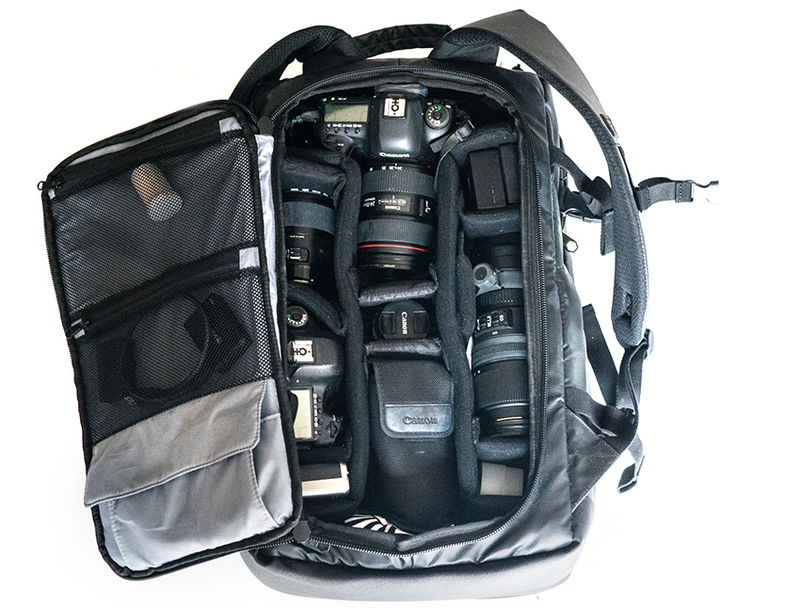 But for assignments that require more gear or travel, a smaller bag just won’t cut it. 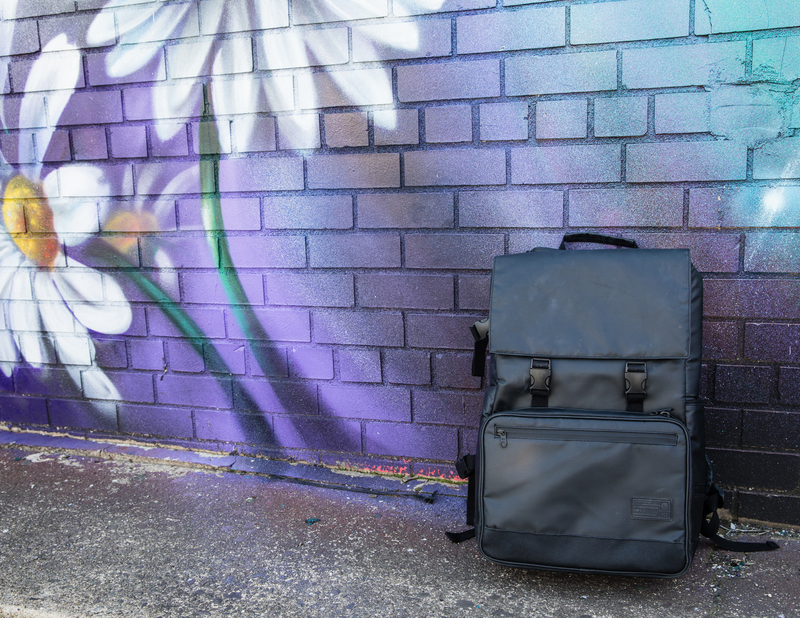 That’s why I was immediately intrigued by the Hex Raven DSLR bag – although I had never heard of the company before – as the design looks different than your typical padded camera backpack. The Hex’s square shape and matte black material were particularly appealing to me. It also looked like it could hold a ton of equipment – a very good thing considering I’d be spending a week in Austin, Texas covering SXSW and a short time later a week on the road touring with a band from Brooklyn. I knew that my typical one body, two lens, one speedlight setup just wasn’t going to cut it for these two jobs. 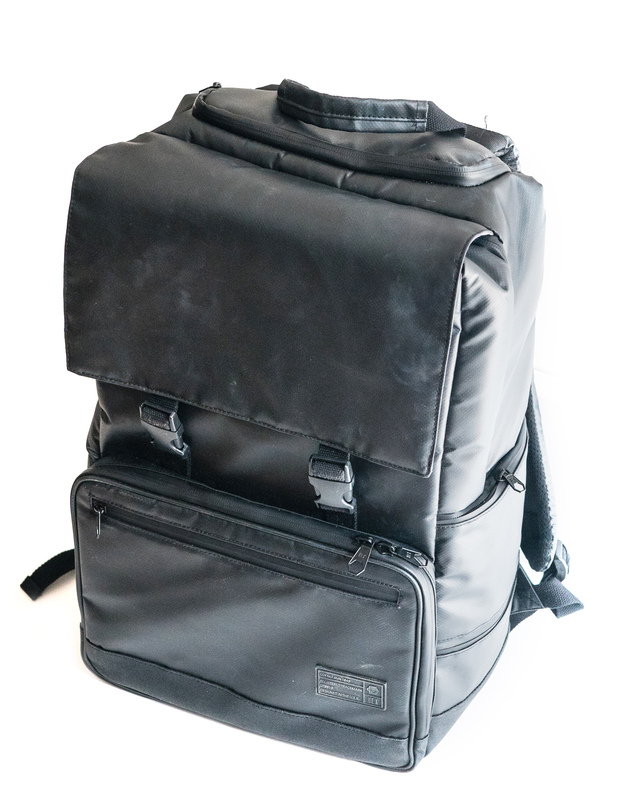 The Hex Raven DSLR bag’s exterior is made of matte black tarpaulin with waterproof zippers. The straps are thick, air-mesh padded. The front of the bag has two compartments. The top one is accessed by undoing the buckles. 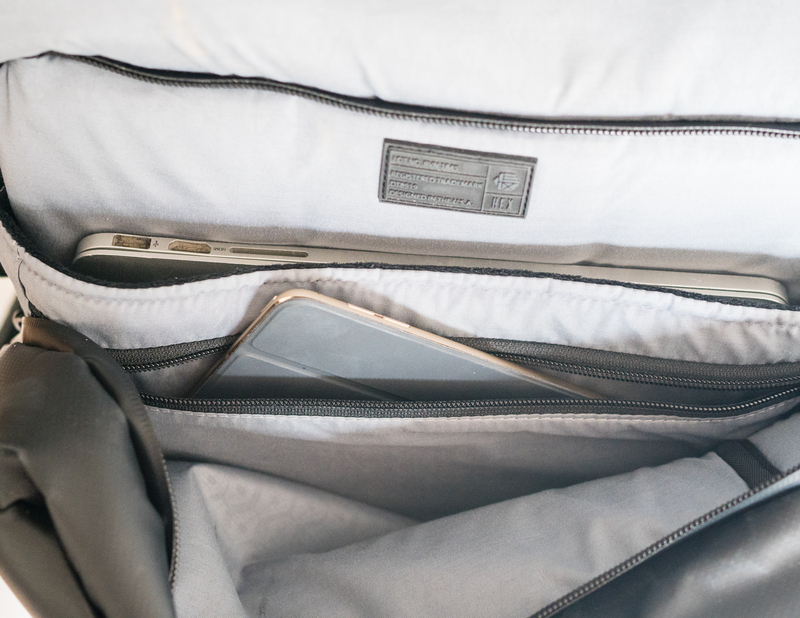 Beneath the flap is a zippered compartment that is fleece-lined and can hold up to a 17″ laptop as well as a small tablet. This section of the Hex is easily accessed, making it convenient to remove these larger items in the rush to get through airport security. Undoing the bag’s buckles reveals a zippered compartment that offers a fleece-lined laptop sleeve and separate space for a tablet. There are two lower zippered pockets. The main space offers room to organize and store items you might want quick access to. 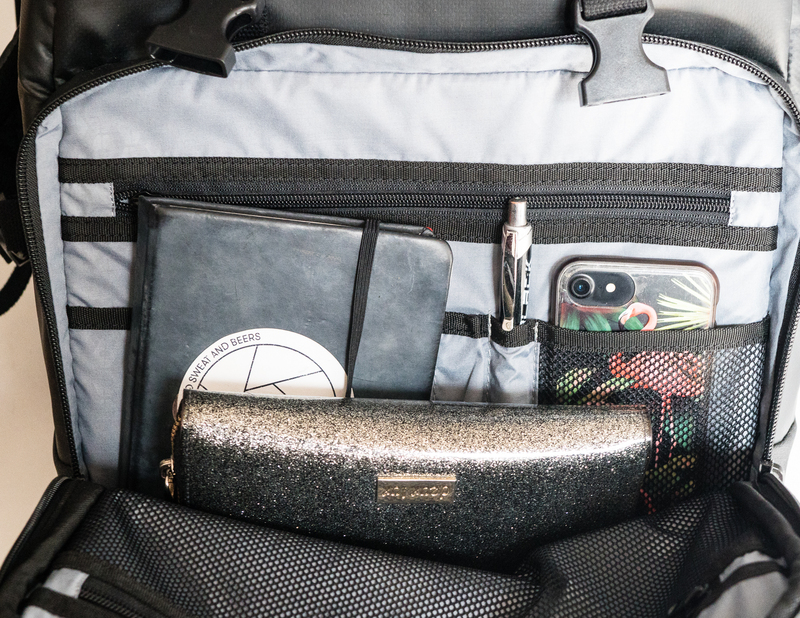 There are two zippered areas on the lower front of the bag, which are great for stashing keys, pens, notebooks, spare batteries or memory cards. On the right side of the bag you’ll find two more small flat zippered pockets, which are fairly easy to access when the thing is on your back – they’re great for holding any odds and ends that you might need such as chapstick, business cards, a small wallet or your phone. On the opposite side of the bag there are straps to attach a tripod. You can attach a tripod to the side of the backpack using the two straps. The opposite side has two very small zippered pockets. 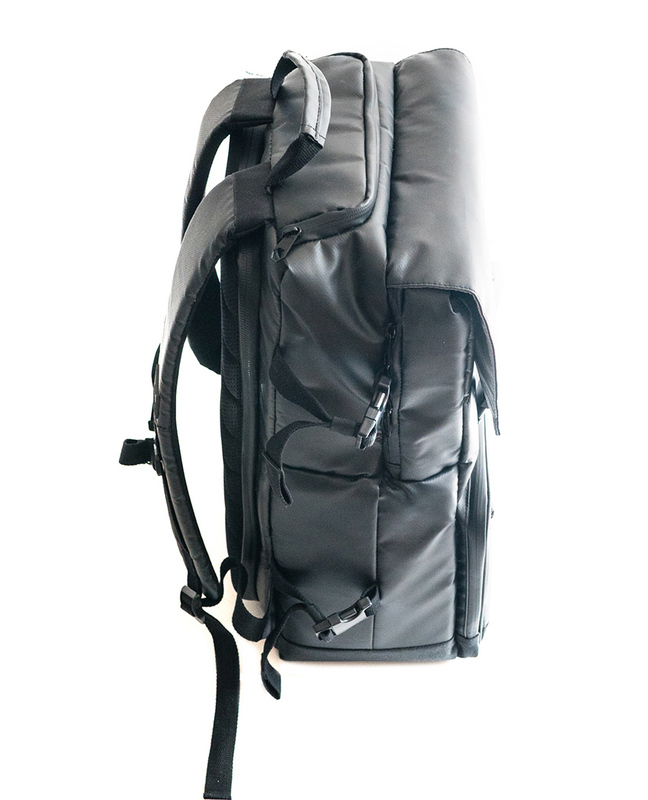 Camera equipment is accessed through the bag’s back panel which is made of EVA foam and air-mesh. The back panel zips along three sides of the bag. The inside features padded partitions that are customizable depending on the amount of gear inside. 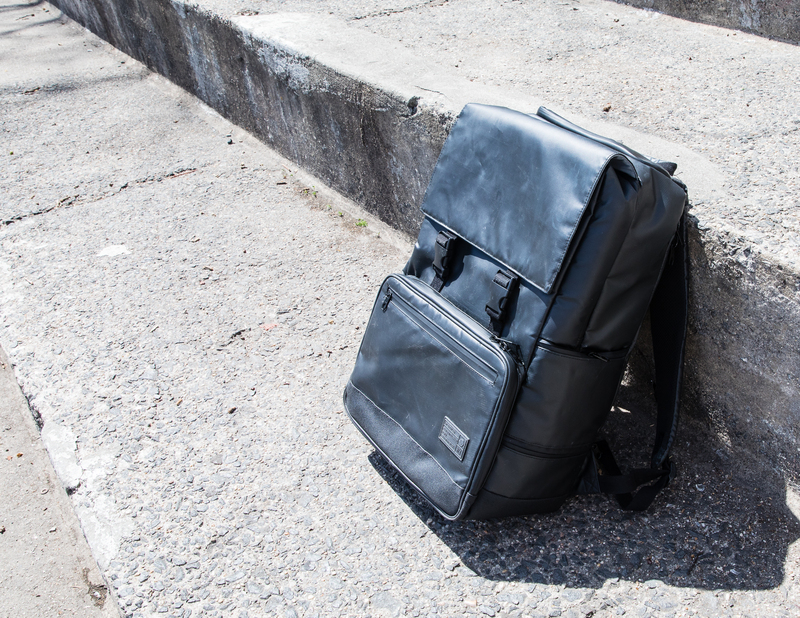 There are also two zippered back pockets and a velcro pouch on the inside for even more storage options. 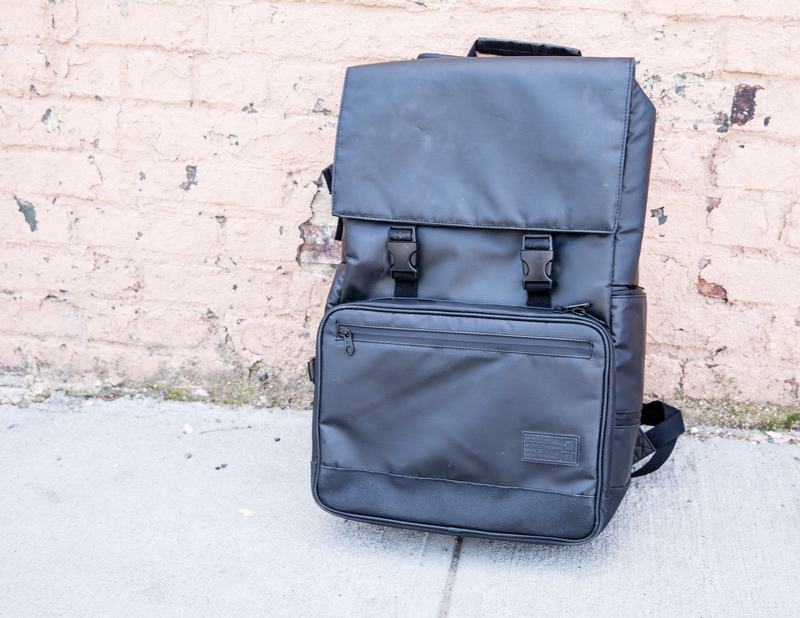 This bag features ample storage, has the ability to hold a ton of gear and its construction feels like it can handle life on the road while keeping your camera equipment safe. The zippers on the Hex bag were a little stiff right out of the box, but after a few weeks of use that stiffness has disappeared—I no longer feel like I have to fight with the Hex bag to access my gear. 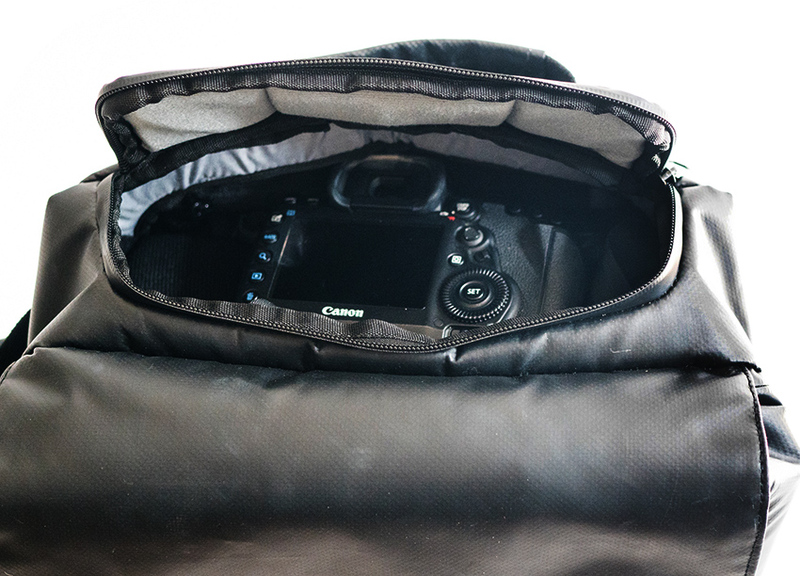 A zipper on the very top of the Hex bag makes it easy to access your primary camera without having to open the main gear section. Although the bag was quite flat when it was empty as I filled it up with my equipment to prepare for my trip to Austin I became skeptical—I wasn’t sure whether its bulk would become overwhelming. I was thoroughly impressed by the amount of gear I was able to fit into the Hex: two bodies (a Canon 5D IV and a 5D III), four lenses (35mm, 50mm, 24-70mm and a 70-200mm), a speedlight, an LED on camera light, four batteries, two chargers, a point and shoot film camera, portable HD, a laptop, a laptop charger and an iPad. That being said, as I prepared to head to the airport and catch my flight to Austin I wasn’t sure that the monster would actually be able to fit under my seat (fully loaded the Hex was almost as large as my carry on roller bag). Although the Hex was certainly heavy with all of this gear, the bag distributed the weight quite nicely. Like many photographers, I’m used to feeling an acute amount of shoulder pain while carrying gear around; I didn’t notice this with the Hex bag. The various storage options within the bag also made it easy to access the pieces of gear I needed, both while going through security and while waiting for my flight – without pulling everything out. Although getting the Hex under the seat in front of me (really my biggest concern in using the bag as a carry on for my flight) was a bit of a struggle, it wasn’t impossible. However, someone with longer legs might find the situation untenable. Here, the amount of individual storage spaces within the bag also made a big difference, as it was easy to grab what I wanted when I wanted it without unpacking the whole thing. Although having a bag with room for so many lenses and a backup body is a plus, realistically the Hex is just too oversized to make sense in the small music venues bands play during SXSW or a cramped photo pit at a larger show—but the Hex was great for safely and comfortably transporting and later storing large amounts of valuable camera equipment while I was traveling. A few weeks later I was prepping to hit the road for a week with a touring band from Brooklyn. My gear storage needs were more or less the same but because we would be traveling by van, space was limited. My photo gear needed to take up way less space than the band’s gear, but still be easy to access so I could edit as we drove from city to city. Although the Hex was still too bulky to be a good fit for inside the small venues where the band was playing, its non-descript look made me feel okay about leaving it inside the locked van in numerous cities with my back up equipment still inside. Its shape and style don’t make it immediately clear that it’s a camera bag, which I’d like to think makes it a little less of a target. The Hex Raven is well designed and feels like it is built to last. The amount of pockets make it easy to organize a large amount of equipment, and they’re functional when it comes to finding specific items in a hurry. It’s certainly a little pricey for a camera backpack, but considering the sheer amount of gear that it can accommodate, its durable construction and the classy design, it seems worth the price tag. I would be interested in checking out a scaled-down version of the Hex for day-to-day use. 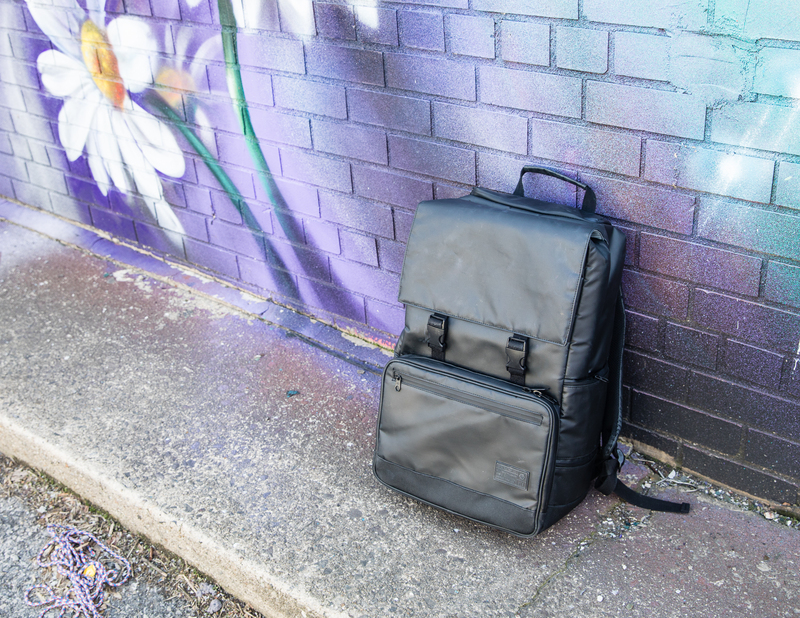 Although the bag is too bulky to be good for everyday use, as a travel bag I appreciate its understated design, storage options and the way in which it evenly distributed weight. I would certainly be interested in checking out a scaled-down version of the Hex for day-to-day use.